When it comes to The Bone Season, I hardly know where to begin. For one, this book has received an innumerable amount of mixed reviews, many of which I find misleading, and for another, this debut is so impressive in its scope that I feel unprepared to truly discuss it. Nevertheless, if one thing is certain concerning Samantha Shannon's novel, it is this: I loved it. From the first few pages of The Bone Season, it is easy to see why so many readers claim this book is full of info-dumping. Even I won't deny it - the first two dozen pages of The Bone Season immediately lay down the foundation for this world, hurling information at the reader at a breakneck speed. Is all of it necessary? No. And yet, it's easy to forgive these first few chapters of an overwhelming nature as the story soon kicks off and this world slowly, but surely, materializes before your eyes. Samantha Shannon is a creative storyteller, building her universe very thoroughly and soon, the world-building is threaded through the narration. Even those first few pages, despite their initial confusion, begin to make sense as the story progresses - which it does - very quickly. In my eyes, this small rough patch shouldn't be a deterrent to the book at all. 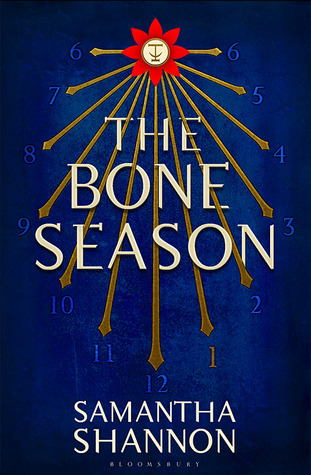 If you were able to get through the beginning of, say, Stormdancer, another debut fantasy I adored, then The Bone Season is not a problem at all. Now, that myth laid to rest, it should be noted that the rest of Samantha Shannon's debut is very nearly perfect. One of my favorite aspects of this book is the fact that it straddles the line between fantasy, dystopian, and paranormal. Although it may seem as if elements of The Bone Season are familiar - dystopian government controlling its citizens, fantasy protagonist with unique abilities - it is still wholly new as well. In some ways, these classic tropes are finally done right and after so many disappointments from these three genres, it was refreshing to see them in a new and improved light. Moreover, Paige, our heroine, is a character whose complexity astounded me. As the story progresses, a new layer is peeled back, exposing us more and more to the vulnerable and insecure Paige who lies within the tough and courageous dreamwalker. One of my favorite aspects of Paige's character is that she is, at her core, a good person. Although she can be rude and sarcastic, lashing out at those who hurt her, she's also always there for those who need her. Furthermore, Paige, unlike most heroines in this genre, already knows how to fight and use her powers. Thus, seeing her hone those skills and overcome her mental barriers to improve was a far more rewarding journey. Paige aside, The Bone Season presents Warden, a.k.a. Mr. Mysterious. What I love about Warden's character is that it's impossible not to hate him. Impossible. As Paige's Keeper, Warden essentially holds power over Paige and is expected to use it. Yet, as the plot wears on, it is obvious that there is more to Warden than what meets the eye. Despite being one of the enemy, Warden helps Paige in small ways that slowly begin to make us doubt his initial motives. Warden and Paige share a strange and complicated relationship, one that evolves into one of trust by the end of the novel. I wouldn't claim that their story arc contains much romance, because it doesn't. It isn't wrought with sexual tension and any glimpses of romantic interest are only gleaned by the end. Thus, the focus of this book on character development, plot, and world-building was gratifying. I have no doubt at all, though, that in the future, this is a swoon-worthy couple to look out for. I must admit, though, that The Bone Season is not a perfect novel. Even past those initial pages, there still remain flaws. Most notably, the secondary characters never come alive on the page. If anything, most of them are seen as expendables for a rebellion and the handful of important secondary characters, who will certainly be playing a big role as the series progresses, are only lightly touched upon. On one hand, this book doesn't really need them to have that added layer of depth. Samantha Shannon gives us just enough information to be satisfied and I suspect that these characters will be elaborated on in the sequels where they play a larger role. Nevertheless, it was a small qualm I reflected upon, long after having finished this book. Ultimately, The Bone Season is not to be missed. With its large marketing campaign, it likely won't be, but it is truly worth the attention it's been receiving. I fell into this book completely, heart and soul, utterly invested in this world and its characters. It's hard to form such tight connections and bonds with just a debut, but Samantha Shannon manages to do it. Granted, her beginnings need a little improvement, and she's certainly not the next J. K. Rowling (no one is! ), but all in all, I have to say that this start is quite a remarkable one. A Quick Note on the Glossary: I was lucky enough to receive an ARC of The Bone Season which came with a printed version of the glossary, which can also be found in the back of the book. Shannon has many different meanings for some terms we take for granted, so during the first hundred pages of the novel, I found myself using the glossary very frequently. It's definitely helpful to have a copy beside you as you read, so that would be my recommendation, especially for those who feel as if they'll struggle with the world-building. I'm so excited for this book now! I was kind of apprehensive about it, but your review made me just so excited to read it! I can't wait to get my hands on a copy. I love how you mentioned the info-dumping because that was one of the big reasons I didn't know if I wanted to read The Bone Season. I'm so excited for this now! Lovely review, Keertana! Ahhhhh! I'm so excited for this book Keertana! I'm so glad to know you loved it, and thanks for heads up on the info dump in the beginning. It's good to know I just need to stick with it through all that and I'll be good to go. Though I'm bummed there's not more romance in this book (you know me), I know there are something like 7 books planned already for this series, so clearly any romance will be slow in developing and I have no doubt completely and utterly worth the wait in the end. Beautiful review! Great Review Keertana! I've been hearing about this book a lot. The author has been dubbed as the next J.K.Rowling in some of the articles. I'm quite reluctant to believe that because they said Erin Morgenstern was the new Rowling and I thought that statement was ridiculous since she was anything but that in my opinion. The book trailer for this one seems really promising. I'm always cautious when it comes to books that have large marketing campaigns.I hope the hype of this book lives up to the expectations of people. I might pick this book up after the hype died down a bit. I'm glad you enjoyed this one :D.
I'm currently reading this! I definitely see what people mean about the info dumping but I was warned beforehand. I'm so glad you liked this book and I hope I will too! Samantha Shannon clearly put a lot of thought into the book. Great review! Ahh goodness, now I wish I pushed myself through with this novel. I DNFed it pretty quickly because I simply could not take the info-dumping. But the way you mention how quickly the world appears in front of the reader's eyes and becomes an amazing world of the Scion makes me really curious. And Paige actually seems like a character I would really like. And it's IMPOSSIBLE to dislike Warden? Hmm.. I'm practically itching to pick this book up again! It's that glossary thing though: I had an eARC of this book, so you imagine how annoying that was! Perhaps I'll pick up a library copy when it comes out. Beautiful review, Keertana! Sometimes I don't mind info dumping but other times it just drags a book down. Looks like it didn't do that for you. Still, disappointed that the secondary characters don't shine. Hm... will have to think about it, but I do like the sound of Warden. Oh wow, there's going to be seven books in this series? Hmm, that's a big commitment! I was lucky enough to have a friend send me an ARC from BEA. I am glad to know about the world building. I got through Stormdancer just fine so I'm not expecting this to be difficult. I love the three elements, dystopian, fantasy and paranormal combined. I need to read my copy fast! Your review really sells me on The Bone Season! Beautiful review! I've seen some mixed reviews for this one but I'm glad to see that you enjoyed it. It sounds like a book I will really love and I will definitely be reading my ARC very soon. Paige and Warden sound like fabulous characters and it seems like such a unique story. Great review! We talked about this already, but you're definitely making me excited to read it! I very much trust your opinion. I haven't read much about this and have ignored my ARC for months because I like to wait until closer to the release date so I think I'm due to read this now! The world sounds different and unique and I promise to keep going, even if I think there's a lot of info at the start! To be honest, every single review I've seen so far has been nothing but positive, so I was excited to read it even before I saw your review. I don't mind being thrown into a world like that, I actually enjoy the sink-or-swim type of worldbuilding, especially when it pays off in the end. Everything about this sounds like absolute perfection and I can't wait for my copy to arrive. I've seen mixed reviews for this one, so it's good to see that you enjoyed it so much! Because you don't love everything, despite the luck you've been having lately. :) Definitely makes me more hopeful that this will end up being a good experience for me, too. I just finished this book today (a little behind the rest of the world, I know). I thought it was an entertaining read. The world building was a bit too intense for me though. Still, I loved the world they lived in. On the other hand, I didn't care so much for the powers they had. I felt like that was poorly explained.